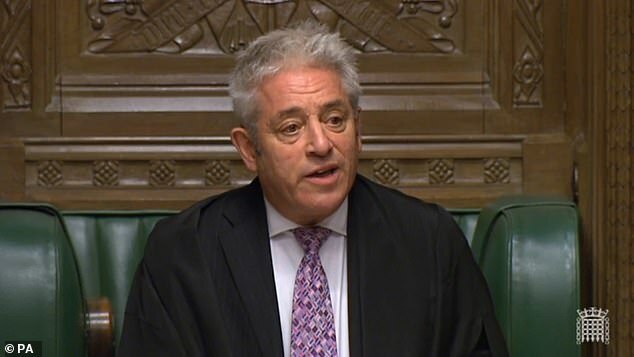 Commons Speaker John Bercow has told MPs that he believes there is an ‘arguable case that a contempt has been committed’ by the Government over Brexit legal advice. 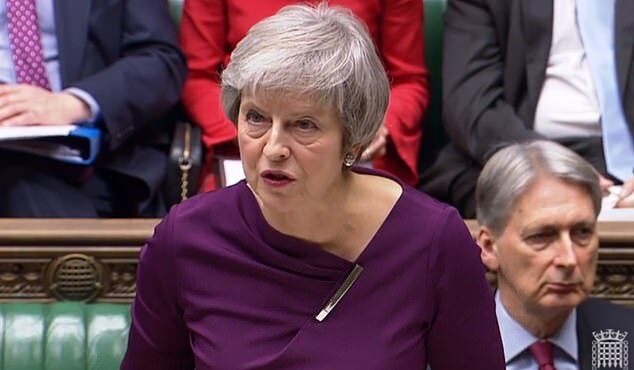 Mr Bercow gave the ruling after representations from Labour, the DUP and four other opposition parties that ministers were in contempt of Parliament for failing to publish the full Brexit legal advice on Monday. 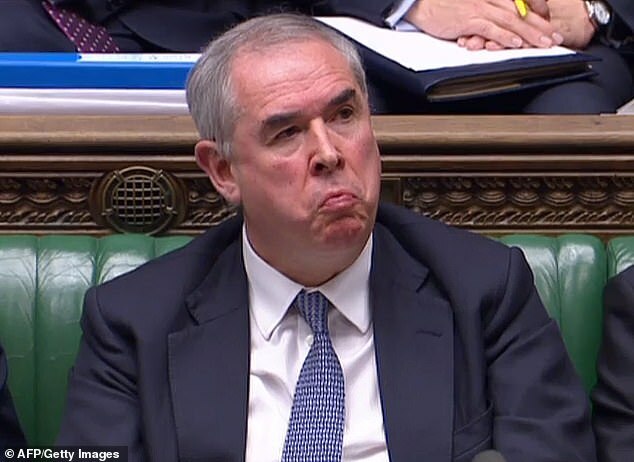 Opposition parties complained, after a fractious two-and-a-half-hour debate, that the summary legal advice released by Attorney General Geoffrey Cox did not comply with a Commons resolution agreed on November 13. 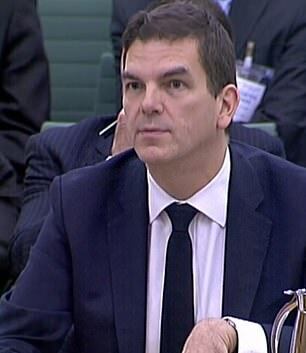 Mr Cox, who is the Government’s chief legal adviser, had staunchly defended the decision – telling MPs ‘there is nothing to see here’. 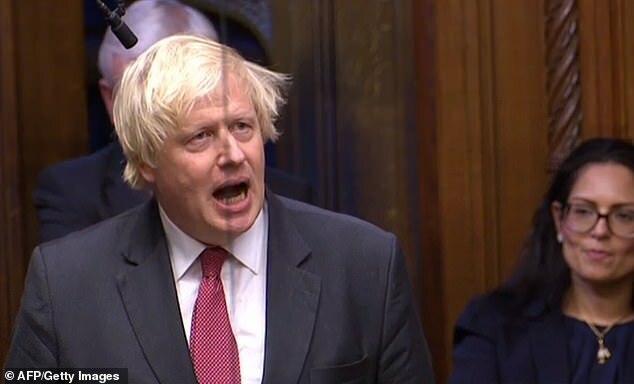 The Speaker however, in a statement to the Commons, said he was ‘satisfied’ the matter should be put before MPs to consider on Tuesday morning. He added: ‘I have considered the matter carefully and I am satisfied that there is an arguable case that a contempt has been committed. Mr Bercow said it was ‘entirely for the House to decide on that motion’. 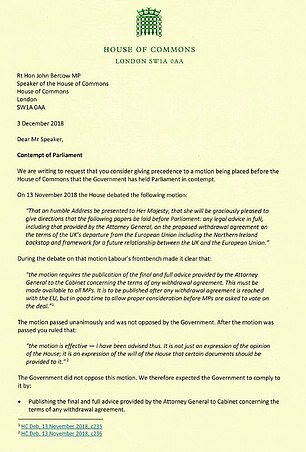 The Attorney General earlier said that he ‘fully accepts’ MPs may impose a sanction against him or the Government for contempt of Parliament over Brexit legal advice. He said: ‘The House has at its disposal the means by which to enforce its will. ‘It can bring a motion of contempt and seek to have that motion passed and seek to impose through the committee, or whichever way it is appropriately done, to impose a sanction. I fully accept that. 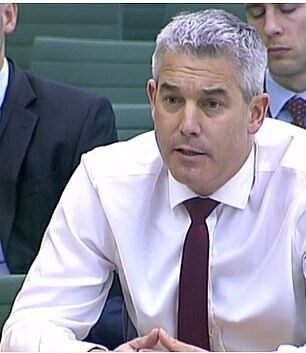 Mr Cox had asked MPs to suppose the advice included details on relationships with foreign states and arguments that might be deployed in the future, noting: ‘Would it be right for the Attorney General, regardless of the harm to the public interest, to divulge his opinion. Mr Cox said it would be difficult to ensure information would be redacted, adding: ‘I cannot take a step that I firmly and truly believe would be contrary to the public interest’. He went on: ‘I ask the House to understand that it is only that consideration that is motivating me and this Government in declining at this stage to break the convention that applies to both sides of the House when they are in government. What is in the summary of legal advice on the Brexit deal? The Northern Ireland backstop lasts indefinitely ‘unless and until it is superseded’ by ‘alternative arrangements’. Agreement on ‘alternative arrangements’ to avoid a hard border is only possible by joint UK-EU agreement. With no agreement, the UK must be able to show ‘clear evidence’ the EU is failing to negotiate in good faith to get a ruling in its favour. The UK cannot unilaterally terminate the divorce treaty. If transition is extended, the UK will have to pay an ‘appropriate’ amount more into the EU budget. This could run to billions. During the transition period, the EU can choose to exclude the UK from ‘security-related sensitive information’ . During the transition period, the UK must accept all new EU laws with no say on writing them. In his statement to MPs earlier today, Mr Cox insisted the backstop part of the divorce was ‘expressly agreed not to be intended to establish a permanent relationship but to be temporary’. He said the Article 50 process did not provide a legal basis for a permanent arrangement. But ‘if the protocol were to come into force, it would continue to apply in international law unless and until it was superseded by the intended subsequent agreement’ which met the goals of avoiding a hard border and protecting the Good Friday Agreement. ‘There is therefore no unilateral right for either party to terminate this arrangement. This means that if no superseding agreement can be reached within the implementation period, the protocol would be activated and in international law would subsist, even if negotiations had broken down. The legal paper gives a more detailed explanation of the ‘best endeavours’ provision in the Withdrawal Agreement. The deal sets out that if the backstop were to come into force, there will be a review process for the UK to break out. Could vote on Brexit deal be delayed to save May’s skin? As pressure grows on the PM, there are claims next week’s Brexit vote could be shelved. 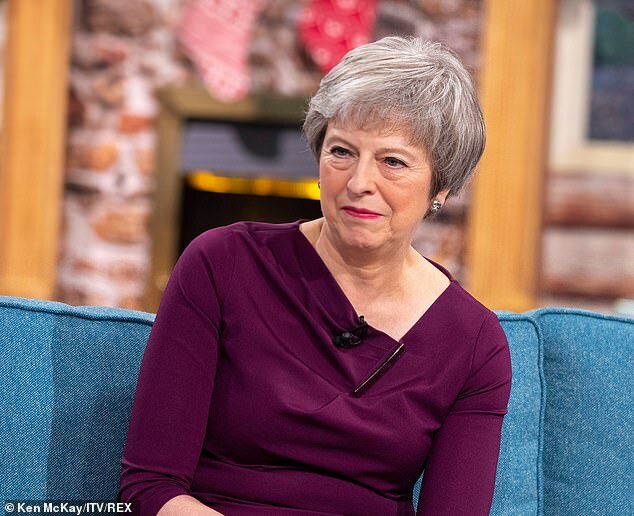 Some Tory whips think a delay could help Theresa May to go back to the EU to renegotiate her deal to avoid a defeat in the Commons. Under the plan, if the situation was still looking dire at the end of this week the Government would abandon the vote. Mrs May could then attempt to reopen talks at a summit in Brussels. However, Sajid Javid – who was said to be one of the minister who back the idea – dismissed it today. And Downing Street insisted the vote will go ahead as planned. The summary argues that the ‘obligation to negotiate in good faith with a view to concluding agreements is a well-recognised concept in international law’. ‘Relevant precedents indicate that such obligations require the parties to conduct negotiations in a meaningful way, contemplate modifications to their respective positions and pay reasonable regard to each other’s interests,’ it says. 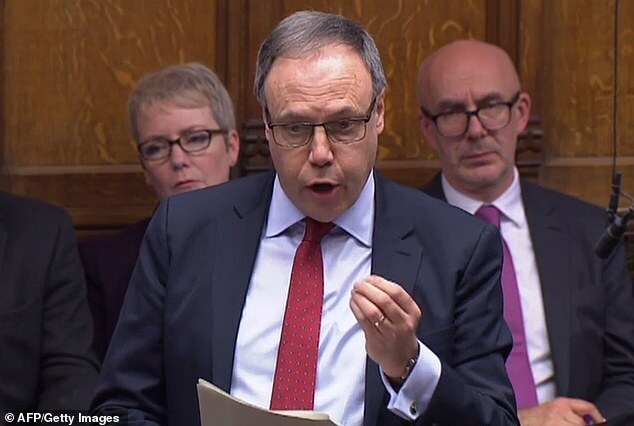 Earlier Mrs May’s chief Brexit adviser told MPs that the Northern Ireland border backstop was a ‘slightly uncomfortable necessity’ for both the UK and the European Union. The fallback plan agreed with Brussels was ‘not the future relationship that either the UK or the EU wants to have with one another’, Olly Robbins told the Exiting the European Union Committee. He said: ‘It is an uncomfortable position for both sides and the reality … is that there is not a withdrawal agreement without a backstop. ‘That reflects also, as I’ve said to this committee before, ministers’ commitments to Northern Ireland and to avoid a hard border on the island of Ireland, rather than being something imposed upon us. Leading businessman Sir Ian Wood has said Theresa May’s Brexit deal is ‘workable’ and is better than the current situation with Europe. 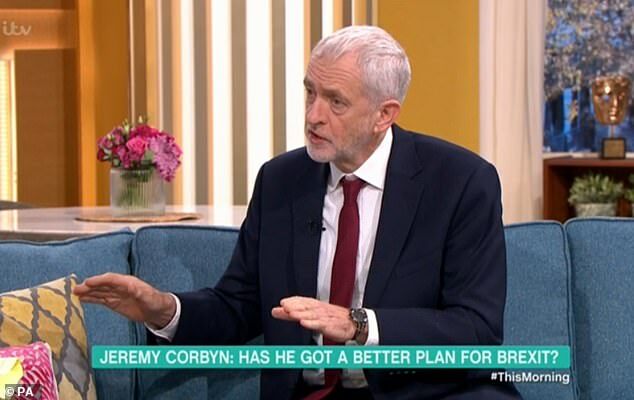 He told BBC Good Morning Scotland: ‘There is not a solution which anyone, or I suspect even more than 50% of people, would really say ‘that’s a really good solution’. ‘There are two extremes and all kinds of ranges in between. ‘I frankly think we do need to move ahead. We cannot afford to have no outcome. Asked if the Government had drafted a clause for the Withdrawal Agreement which would have allowed the UK to opt out of the backstop unilaterally, Mr Robbins said: ‘Ministers asked us to look at a whole range of options for how to bring the backstop to an end, and so we did. ‘And the Prime Minister and other ministers tested some of those out on European partners. The UK faces making additional payments to Brussels if the Brexit implementation period is extended, the Government’s Brexit legal advice also said. Under the terms of the Withdrawal Agreement, it is due to run until the end of December 2020 but can be extended by up to two years if both sides agree. The advice says that discussions on any extension would involve ‘reaching further agreement on the UK’s financial contribution’. Labour’s Chris Bryant, a supporter of the People’s Vote campaign for a second referendum, attacked the paper’s release when MPs had demanded to see the full legal advice given to ministers by Mr Cox. He said: ‘The House of Commons was very clear that the full legal advice to the Cabinet should be supplied to Members of Parliament. 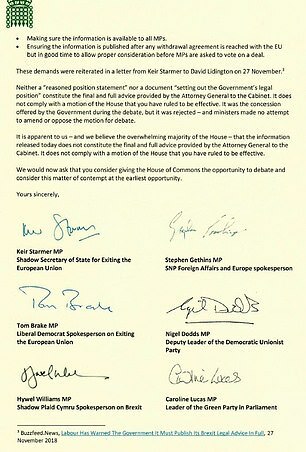 MPs across Parliament have angrily accused ministers of ignoring the will of the House by only releasing a ‘full reasoned political statement’ on the legal position. House of Commons lawyers have raised fresh questions about the Irish border backstop in Theresa May’s Brexit deal. An internal assessment by the House’s EU legislation team highlights that the customs arrangements would be a ‘practical barrier to the UK entering separate trade agreements on goods with third countries’. It also suggests the Joint Committee to arbitrate over the Withdrawal Agreement could put Britain at a ‘practical disadvantage’. ‘If the Joint Committee is unable to reach a decision, in some circumstances, that will block next steps,’ the note says. ‘The party that wants those next steps to occur, will then be at a practical disadvantage. Downing Street has acknowledged that the backstop would hamper trade deals on goods, but argues that the EU would also be unhappy to keep the arrangements indefinitely. The PM’s aides insist the country would still be able to do deals on services. Mr Cox is said to have warned the UK could be tied to the EU customs union ‘indefinitely’ through the Northern Ireland ‘backstop’. ‘The protocol would endure indefinitely,’ he apparently wrote. 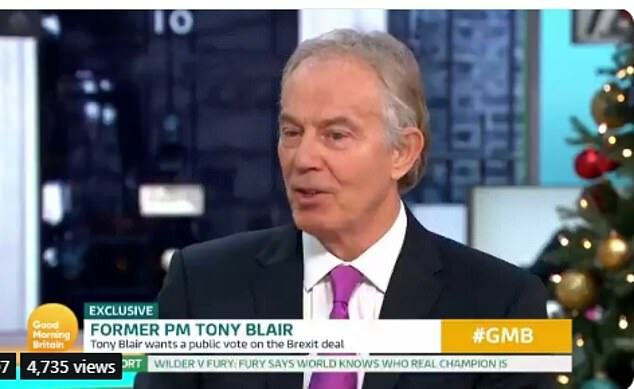 Tony Blair faced a fiery grilling today as he was challenged over why he is calling for another Brexit referendum just two years after the historic vote. The ex-PM is stepping up his campaign for a so-called People’s Vote and lashed Theresa May’s deal for ‘yielding’ too much to Brussels. 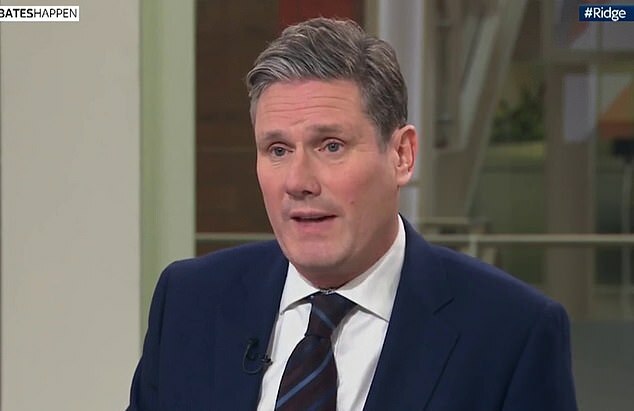 Appearing on ITV’s Good Morning Britain, he said another referendum should be held which gives Britons a choice between staying in the EU or having a Boris Johnson-style hard Brexit. But presenters Susanna Reid and Piers Morgan quizzed him over why Remain should even be on the ballot two years after the side lost. In a heated exchange with the former Labour leader, Susanna said: ‘Why should Remain even be an option on the second referendum? 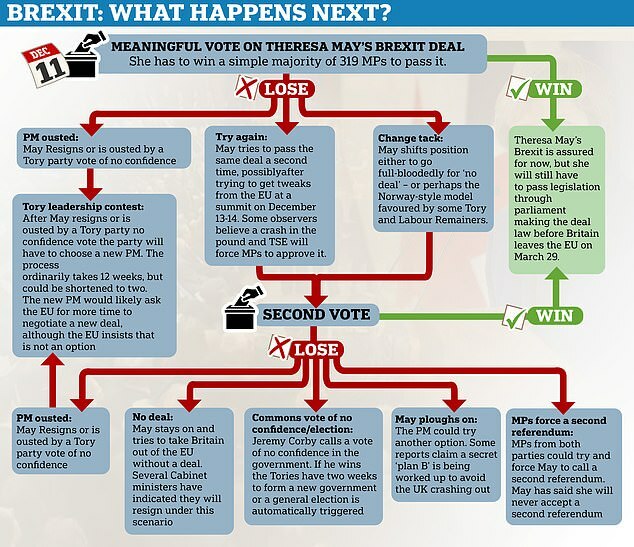 Why isn’t it a choice between May’s deal and an alternative Brexit? He said there is also a ‘good chance’ Brussels would give the UK more concessions to the UK.